The Mother’s Day Gospel brunch was so much fun, 210 Restaurant & Live Music Lounge decided to bring it back. Enjoy a delicious brunch and live music from Jeannie Holliday and the Archie Parks Project from 11 a.m. to 2 p.m. Sunday, July 2. HIGHWOOD, IL, June 20, 2017 /24-7PressRelease/ — The Mother’s Day Gospel brunch was so much fun, 210 Restaurant & Live Music Lounge (210 Green Bay Rd, Highwood IL, 60040; 847-433-0304) could not wait to do it again. Enjoy a delicious brunch and live music from Jeannie Holliday and the Archie Parks Project from 11 a.m. to 2 p.m. Sunday, July 2. Enjoy delicate finger foods and indulgent plate dishes like Deviled Eggs, Cranberry Tuna Salad, House Smoked Lox with Mini Bagels, Chopped Liver and a selection of refreshing salads: Cucumber Dill Salad, Heirloom Tomatoes Caprese and Cesar Salad. Additionally, there will be a Biscuits Egg Benedict Station with two choices of preparation style: Traditional or Florentine. For something a little heartier, load your plate with Shrimp & Chicken Gumbo, Andouille Jambalaya, Pit Smoked Ham, Scalloped Potatoes, Roast Turkey with Cornbread Stuffing and Gravy, Corn Pudding, Roast Scottish Salmon with Citrus and Capers, and Asparagus Polonaise. For dessert, indulge in 210’s decadent Chocolate Mousse, Cheesecake Bars, Strawberry Rhubarb Bars, Pecan Bars or keep it light with fresh fruit and cookies. The brunch is $ $34.95 for adults and $19.95 for kids 11 and under. Make reservations online or by calling (847) 433-0304. 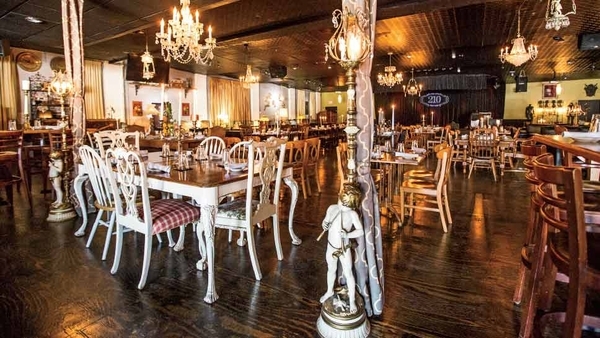 210 Restaurant & Live Music Lounge, located at 210 Green Bay Road in Highwood, Illinois, is a true supper club where guests enjoy live music five nights a week and delicious chef-driven dining. 210 is a community of musicians, food enthusiasts, and neighbors-an inviting, comfortable and romantic environment where singles, couples and families escape from their everyday life to relax, enjoy and indulge. 210 Restaurant & Live Music Lounge is open 5 p.m. to midnight Wednesday, Thursday and Sunday and from 5 p.m. to 2 a.m. Friday and Saturday.